The United States Congress designated the Mount Tipton Wilderness (map) in 1990 and it now has a total of 31,520 acres. All of this wilderness is located in Arizona and is managed by the Bureau of Land Management. This Wilderness contains the entire northern half of the imposing Cerbat Mountains. Although 7,148-foot Mount Tipton dominates the area (the lowest point in the Wilderness being about 3,300 feet), the real eye-catching attraction, the true centerpiece of the Wilderness, is located north of and below Tipton: the Pinnacles, immense tusklike rows of maroon-colored spires towering above open, yellow desert valleys. If you make the physically challenging climb up Mount Tipton, you'll discover a stand of large ponderosa pines on the northeast side and tremendous views in all directions, including the Pinnacles. 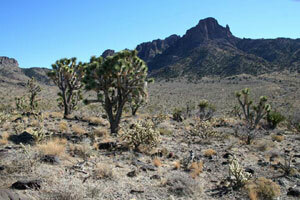 Deep washes divided by descending ridges, small valleys, and bowls are found throughout the area. Unlike the nearby Black Mountains, the Cerbats are highly vegetated on their upper slopes with piñon pine, shrub live oak, manzanita, bear grass, and desert ceanothus. Large granite outcroppings break the ridgelines, the gray and red rock contrasting with the green vegetation. You'll probably encounter mule deer and raptors, and perhaps catch a glimpse of a kit fox, bobcat, and a Gambel's quail or two. Backcountry explorers should pack plenty of water in with them. The summer climate in this area is harsh, with temperatures in the daytime often exceeding 100 degrees. Winter months can be quite cold and snow is possible at higher elevations, but temperatures are most moderate between October and April. Planning to Visit the Mount Tipton Wilderness? How to follow the seven standard Leave No Trace principles differs in different parts of the country (desert vs. Rocky Mountains). Click on any of the principles listed below to learn more about how they apply in the Mount Tipton Wilderness.